Besides the flavor, kimchi is a rockstar in the probiotic and anti-inflammatory diet world. “Gut health” is a popular topic these days, and rightly so. Your digestive health can be a key component to your overall health and well-being. The fermentation process used to make kimchi produces gut-beneficial bacteria that help to keep your body running smoothly. What is kimchi (or kimchee)? If you’ve ever eaten Korean food, there’s a good chance you’ve tried kimchi. Spicy and salty, it’s a fantastic accompaniment to grilled meats. Kimchi is a condiment made of fermented vegetables, such as Napa cabbage, and plenty of seasonings. Seasonings often include ginger, garlic, onion, scallions, fish sauce or fermented anchovies and Korean chili flakes (gochugaru). Because kimchi typically includes fish sauce, fermented anchovies or Korean salted shrimp, it is not vegetarian. However, more and more vegetarian brands are coming available. Just be sure to read the ingredients list! One word to the wise: Even though kimchi contains gut-friendly bacteria (probiotics! ), take care not to go overboard on your consumption, particularly if you’re watching your sodium intake. Up until a few years ago, kimchi could only be found at restaurants and at Asian markets. But the kimchi market has exploded and a wide variety of brands can be found at health food stores and many well-stocked supermarkets. Cauliflower rice can be bought in many grocery stores, either in the frozen foods or produce sections. I use the raw cauliflower rice from Trader Joe’s. If you use a frozen variety and cook it according to the package directions – typically in the microwave or a skillet – the cooking time in this recipe should be decreased. 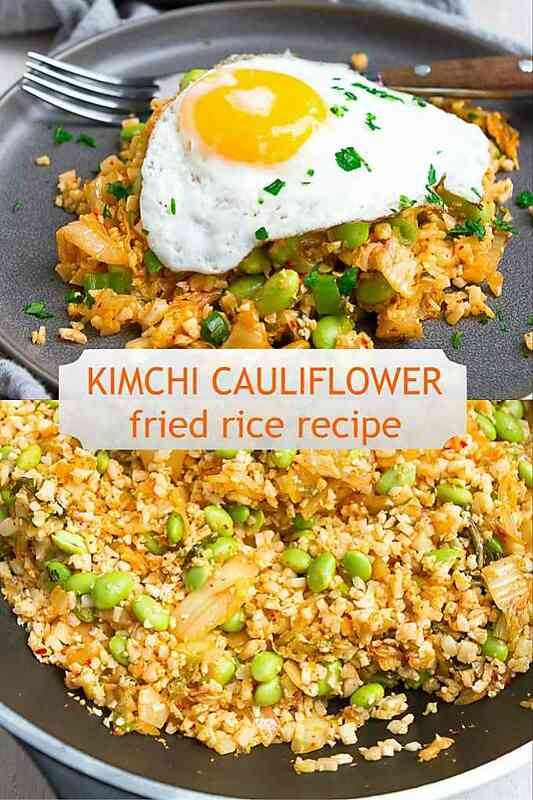 If you prefer to make cauliflower rice from scratch, check out the tips in this post. On the lid of the kimchi I often use, there are instructions to “Open slowly over the kitchen sink.” They’re not kidding! Because fermentation produces so much gas, there is a lot of pressure inside of a kimchi jar. Opening the jar VERY SLOWLY will help to preserve some of the liquid, which you’ll need for the recipe. 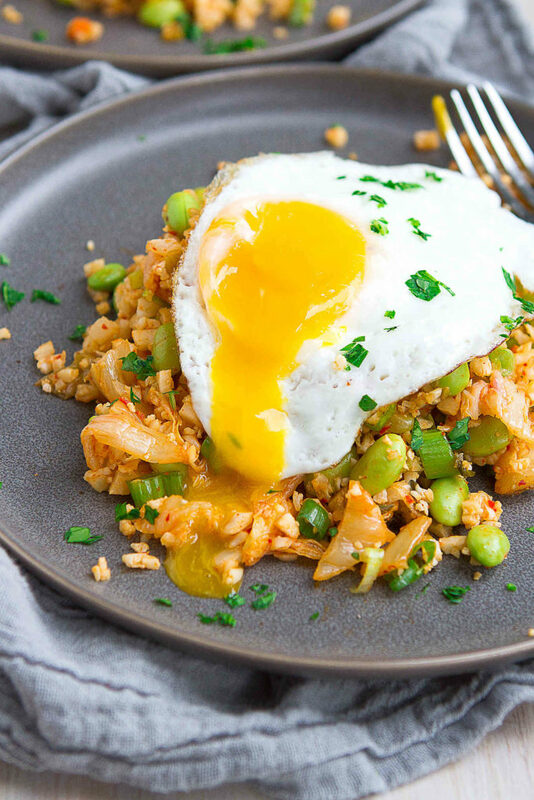 Melt the ghee in a nonstick skillet. If you prefer, coconut oil can also be used. Sauté the white sections of the green onion, the kimchi and the kimchi juice. Next, the cauliflower rice cooks for a few minutes before adding the edamame. Since the edamame are already cooked, you’re really just re-heating them in this step. 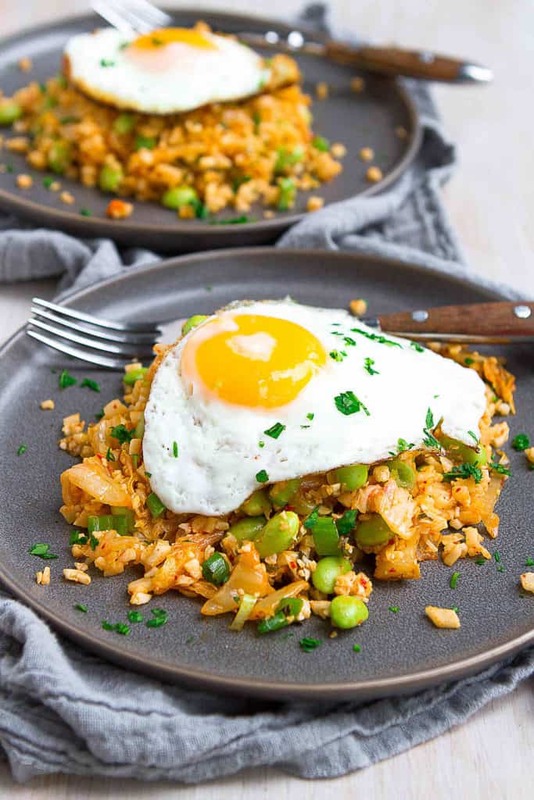 Season with soy sauce and sesame, stir in the green onions and serve with a fried egg on top. If you prefer to serve this as a side dish, just leave off the egg. Heat a large nonstick skillet over medium-high heat and add the ghee. Add the white and light green parts of the green onion and cook, stirring frequently, for 2 minutes. Add the kimchi and kimchi juice, and cook for 2 minutes. 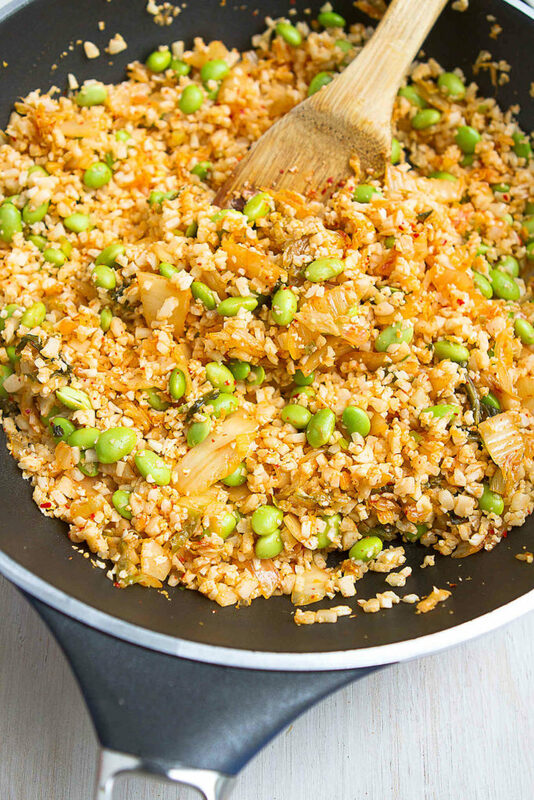 Stir in the cauliflower rice. Cook, stirring constantly, for 2 minutes. Add the edamame, soy sauce and sesame oil. Continue to cook, stirring constantly, until the cauliflower is tender, about 3 minutes. Remove from the heat and stir in the green sections of the green onion. Divide the mixture between 4 plates. Top each with a fried egg. Serve. Heat a medium nonstick skillet over medium heat. Lightly coat with cooking spray (use ghee or coconut oil, if preferred) then crack the eggs into the pan.